Since April, Union Room and Projector have been helping The Works create a completely new platform to market and sell award winning art work. 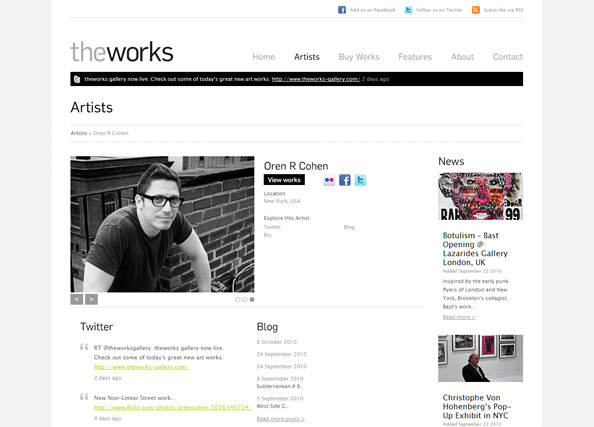 The Works have managed to secure the services of some top creatives, mainly from New York, and will be looking to help these artists sell their work new markets, focussing heavily on Social Networking.. Well-known artists such as Jason Florio (who was at the foot of the World Trade Center as it collapsed on September 11th), Christophe Von Hohenberg (who’s work has been featured in Vogue and Vanity Fair. He also shot some world famous pieces of the Andy Warhol funeral) and Michel Delsol (who’s shot David Lynch, Jim Belushi and the Beastie Boys amongst others) are a real coup for the Works and help fill the site with some quite frankly amazing material. All artists featured on the website are award-winning, ensuring the standard of work is as high as possible. “Union Room and Projector have played an important part in making our initial ideas and vision a reality and a functioning on-line business. It has been a real pleasure working with such an enthusiastic, talented and dedicated team. At every stage of the project we felt that the ultimate vision was kept in mind and that the team worked closely with us as real partners. From top to bottom in their business they have been incredibly flexible at all times. We always knew that we could pick the phone up to any member of the team and have a very constructive conversation – I feel that this approach absolutely sets them apart in a very competitive sector. We have referred both companies to other associates and clients of ours. We feel that this speaks volumes regarding the experiences we have enjoyed”. Behind the website, lies a custom-built content management system which allows the Works team to list items for sale (including price, description, size, format, price, stock, images and also whether or not the item is featured on the homepage or artist galleries) as well as adding, editing and deleting artist profiles. 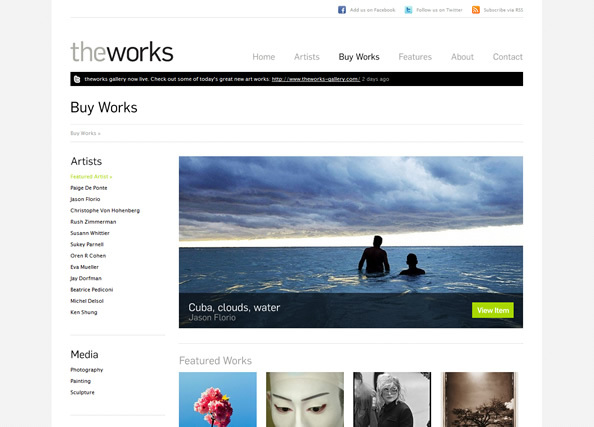 As well as this custom-built CMS, we’ve also given the Works their own WordPress blog, with custom built theme. The blog has been built to allow the Works to control which blog posts are shown on the homepage, in the featured and news sections. 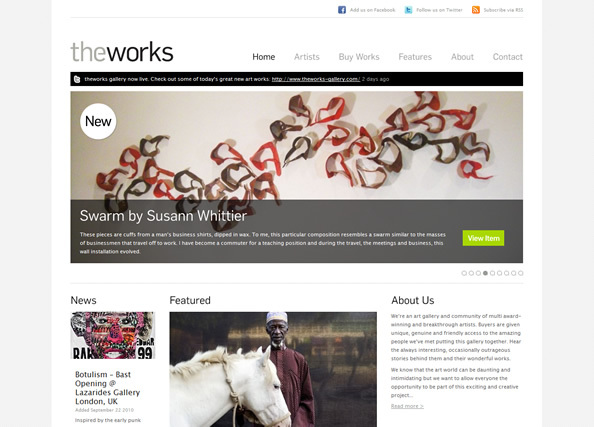 The Works have always had a strong focus on social networking and interaction. This is highlighted in their approach to artist bio’s, video, blog feeds and twitter integration, allowing the user to get closer to the artists on show. This artist involvement was always important to the Works, as they felt the connection between the buyer and artist, wasn’t always present in a traditional gallery environment. “We continue to meet amazing artists in the creation of this business and want to provide a platform that would allow our customers to hear the stories that we’ve heard behind the people and their work. We want this to be an ever evolving part of the business that harnesses the real power of Social Networking to connect our customers and artists in new and interesting ways”. We’re already planning the next stages of the Works project, with some interesting developments in the way of community interaction and live events through the website. Take a look at the finished website by clicking here.